The tree on the left is derived from interrelationships proposed by Gruber (1998) based on morphology. The monotypic Dicranolasmatidae comprise currently 16 species in the Western Palearctic with center of distribution in Italy, the Balkan Peninsula and to the Caucasus and Iran in the East. They are unmistakable given their bifurcate head cap covering the chelicerae with the eyes situated in the middle of the individual branches. Body form is globular in contrast to the similar but predominantly flat Trogulidae and the number of tarsal segments are increased in comparison. They exhibit advanced soil crypsis, gluing large amounts of soil to their integument and fixed by elongated papillae, that accumulates to sometimes half the body height. Dicranolasma is monophyletic and close sister to Trogulidae in all studies (e.g. Giribet et al. 2010; Schönhofer and Martens 2010) but seems to have an intermediate position between Trogulidae and Nemastomatidae, which is also apparent in the transient morphology (e.g. body form, head cap, soil crypsis, clavate hairs on palps, high count of tarsal segments). Genital morphological differences to Trogulidae are minor when compared to the diversity within the Nemastomatidae. Species delineation and relationships within the genus have been studied by Gruber (1974, 1998). In the widespread Dicranolasma soerenseni and D. opilionoides further cryptic species are to be expected, as is likely true for the still underexplored Asian distribution of the genus. Dicranolasma inhabits humid well structured soil habitats, often in combination with calcareous bedrock that is sheltered by forest. Adults can be found year-round. Many species enter caves frequently, yet cave adaption seems absent. Prey specialization on snails in Dicranolasma scabrum has been reported and is likely the case throughout the genus. Giribet, G., Vogt, L., Pérez-González, A., Sharma, P. and A. B. Kury. 2010. 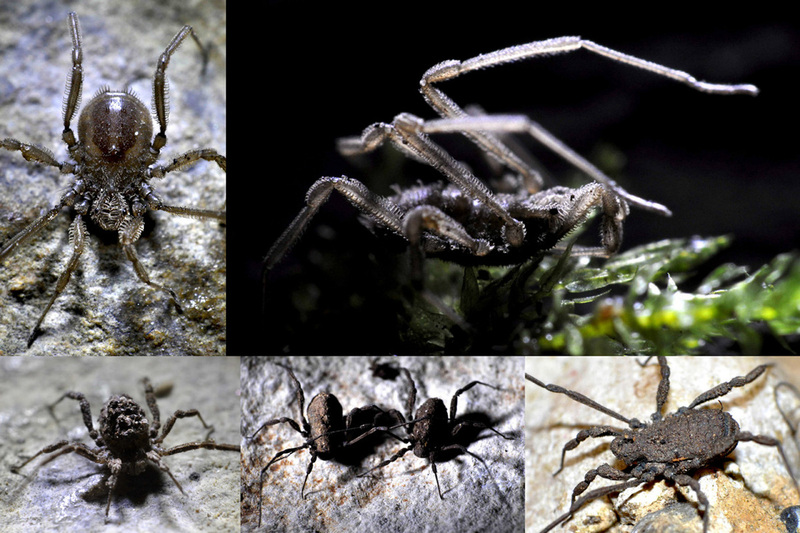 A multilocus approach to harvestman (Arachnida: Opiliones) phylogeny with emphasis on biogeography and the systematics of Laniatores. Cladistics 26:408-437. Gruber, J. 1974. Ein Beitrag zur Systematik, Morphologie und Bionomie der Gattung Dicranolasma SØRENSEN (Arachnida: Opiliones). Dissertation philosophische Fakultät, Wien (unpublished). Gruber, J. 1998. Beiträge zur Systematik der Gattung Dicranolasma (Arachnida: Opiliones, Dicranolasmatidae). I. Dicranolasma thracium STAREGA und verwandte Formen aus Südosteuropa und Südwestasien. Annalen des Naturhistorischen Museums in Wien 100B:489-537. Schönhofer, A. L. and J. Martens. 2010. Hidden Mediterranean diversity: Assessing species taxa by molecular phylogeny within the opilionid family Trogulidae (Arachnida, Opiliones). Molecular Phylogenetics and Evolution 54(1):59-75.